A while ago Diggers club advertised what they claimed to be an exclusive yellow fruited raspberry plant. They looked and sounded amazing! “Diggers gold” raspberry plants were listed on their web site, it was listed in their printed catalogues, at first they were only for Diggers members but eventually it was sold through their shops, and it was sold through other stores that carry their line of plants. The stock photos of yellow raspberries they used looked amazing, and their embellished and fanciful description of the plant sounded great. Diggers arrogantly renamed this variety to ‘Diggers gold’ even though they had not bred it and had never actually grown them, not even once. I am not sure if they bought the naming rights or if they just decided to rename it to make it more marketable like they do with so many other plants and seeds that they sell. This level of contempt and arrogance is typical of many of my experiences with Diggers Club. Here is the irony, I love this part: the raspberry variety that Diggers actually had, the one that they renamed to be “Diggers Gold”, was actually a red fruited raspberry. If you looked on Diggers club facebook page you either see comments from people who say they can’t wait for them to fruit, or comments complaining that they had red fruit. Not a single comment on there said that they grew yellow fruit. Not one. It certainly appears that Diggers did not sell a single yellow fruited raspberry. 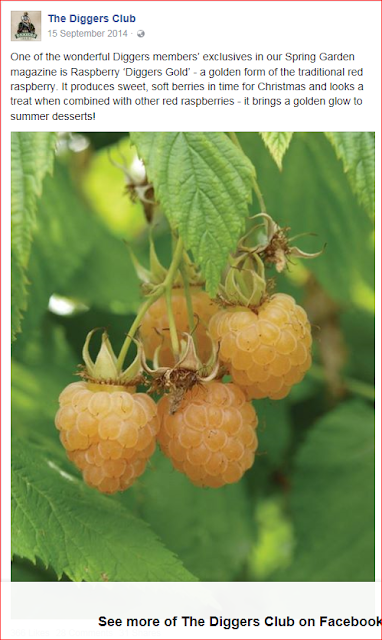 Diggers club sold these ‘diggers gold’ raspberry plants to many, many home gardeners. A year or so later when they had red fruit a reasonable number of these people complained because they did not get what they paid for. Diggers sent replacement plants to most people who complained, and they grew the plants on for another year and a half, only to have red fruit again. For some people, this happened more times and they never got what they paid for. Some people were tricked to think that fruit colour was influenced by growing conditions (which it is not) or somehow they were to blame. Others were offered credit on their next purchase. I almost bought a Diggers membership just so I could get a golden raspberry, I am so glad that I didn't fall for their lies again. I have heard people try to justify all of this and say that they still got raspberries - unfortunately that isn’t good enough. If I wanted to buy an inferior and unnamed random variety of raspberry I would do that and not pay the high prices and inflated and unjustified postage cost that Diggers has. People made space for these things when they could have grown something far better. It is the time spent growing the wrong thing that is the biggest loss – you can’t get back time. You would have thought that with such a large company and paying inflated prices for something they claim to be exclusive that you would have some assurance in actually getting what you paid for, apparently not with Diggers club. With the Diggers club you don’t always get what you pay for. Rest assured, Diggers doesn’t currently list ‘Diggers gold raspberries’. Perhaps one day they will rename another variety of raspberry to be ‘Diggers gold’ and maybe it will be yellow fruited? Perhaps one day Diggers club will have a yellow raspberry and rename it to be something else or add 'Clive' to the cultivar name? I wouldn’t risk buying from them though. Some people had such a bad experience with Diggers club and spent so much time growing diggers gold (red fruited) raspberries that they think yellow raspberries don’t actually exist. 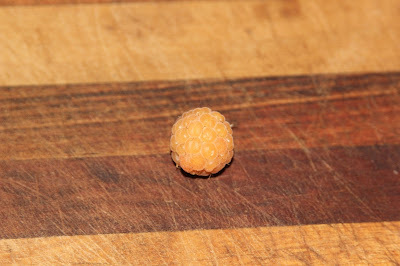 I am happy to say that yellow fruiting raspberries do exist in Australia, I grow them. I paid a small fortune to get a few plants from someone trustworthy (ie not Diggers club or ebay) and it was worth it. My golden raspberry plants are an un-named variety, they looked very strong and healthy. I planted the golden raspberries in two different positions to ensure that they would not die off. Apparently they were well suited to both of these positions as they have all done well and spread nicely. 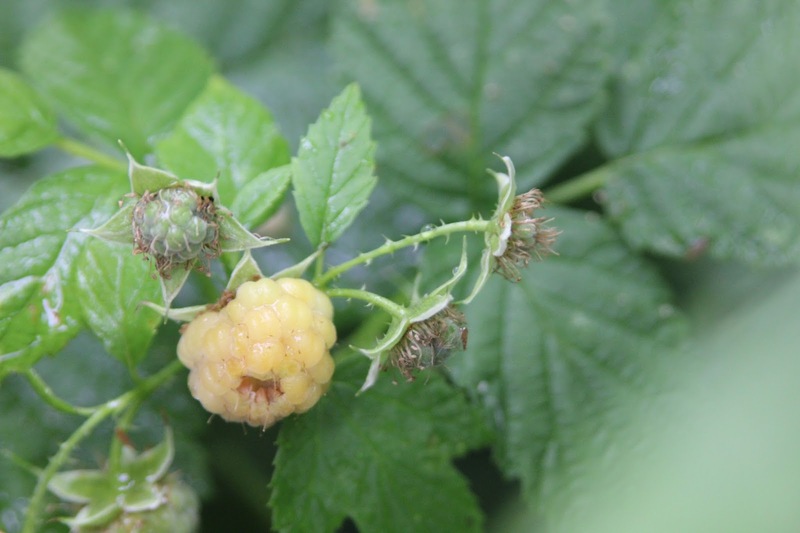 Like many other varieties of raspberry they have thorns (botanically these are 'prickles'), and it is a floricane variety, meaning that it will not flower or fruit on current year growth. It needs previous year growth to flower and fruit. This is why it often takes a while to get the first fruit but once they do fruit once they should fruit each year from then onwards. My golden raspberries fruited around Christmas time and spread out the harvest for a few weeks. 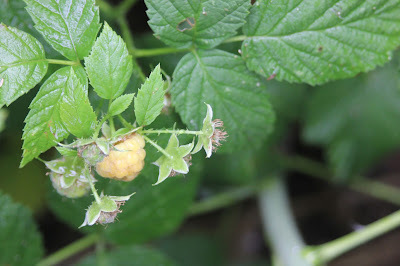 I wrote another post on golden raspberry days to maturity. This variety also has the habit of spreading roots under the soil and growing extra canes from the root tips. This means that an investment in a few plants can quickly expand and fill in an entire patch. I love how raspberries do this. My golden raspberries taste much like red raspberries, except they are much sweeter. They smell sweet and fruity, I really love the way they smell. 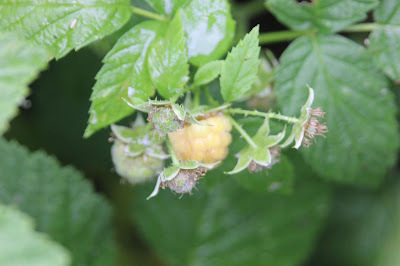 The fruit is super soft and delicate, this is perfect for home gardeners who will carry the raspberries to where they are to be eaten, but not great if you plan to transport it to supermarkets across the country, which is why you don't see many yellow raspberries in the shops. The colour of golden raspberries is pretty remarkable, I am no photographer so my pictures don't do them justice. They range from a bright golden yellow to a richer yellow on the same plant. 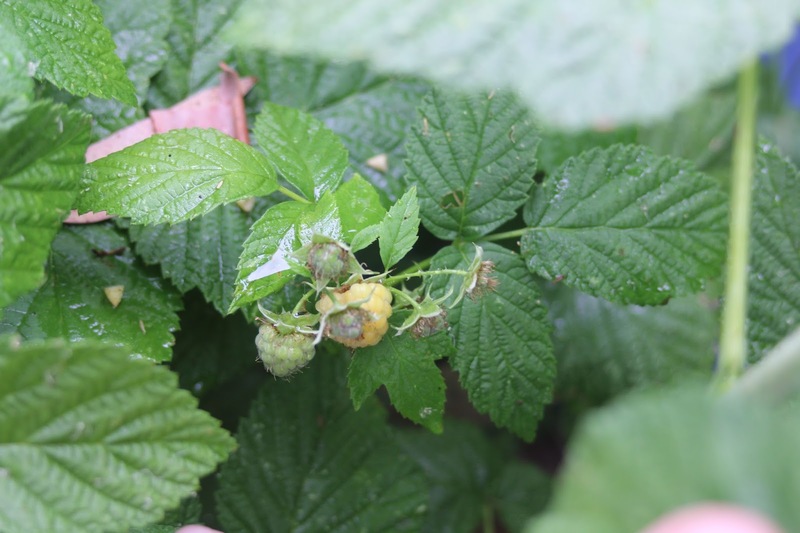 Birds seem to ignore the yellow fruit, then again birds seem to ignore red raspberries too. Insects, slugs and children on the other hand do not ignore them and find them irresistible. 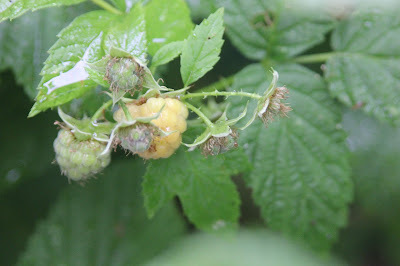 My kids comment on how they love the fruity smell of golden raspberries. The plants seem reasonably productive and just as hardy as other varieties. They don't appear to grow any taller or shorter than my other varieties. In fact, when they are not fruiting I would not be able to tell them apart from many of the other varieties I grow. Golden raspberry plants are difficult to find, please NEVER buy seeds from ebay as you will be sent seeds but not yellow fruited raspberry seed. By the time you work it out, assuming that you get any to germinate, it will be too late to do anything. Please don't buy from Diggers club if they ever claim to have golden raspberries again. The utter contempt that they showed in their first botched attempt (and the many other times they have disappointed customers with similar disrespectful stunts) should be enough to warn you off buying from them. Over winter when my plants are dormant I will hopefully have a few extra that I can sell through my for sale page. If all goes well I should be able to sell a few each winter. Unfortunately I can't offer pre-purchasing as I would hate to have a crop failure or something and not be able to come through.